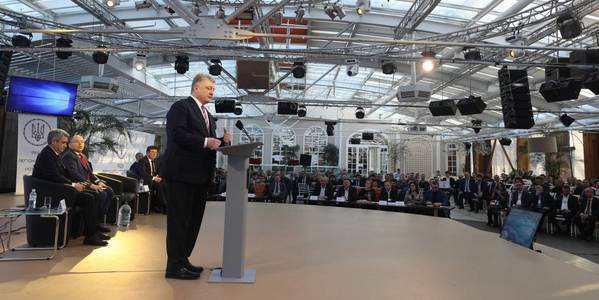 President Petro Poroshenko is convinced that the beginning of the development of amalgamated hromadas should be continued in high living standards for the residents of these hromadas. “The results we have today are just the beginning of the process. The fruits of our work will definitely emerge in the future, when every village, city, rayon, oblast resident feels with his own wallet that the country goes forward,” he said at the Regional Development Council in the Odesa Oblast. The President expressed his gratitude to hromada leaders for their work, but noted that much more needs to be done. He shared his own vision of what should be achieved in AHs, in the local self-government. “To my deep conviction, there should be roads, high-quality roads in every amalgamated hromada. I remind you that in the past two years, within the customs experiment initiated by me, Odesa Oblast received UAH 3.1 billion for the construction of roads. 455 km of roads have already been built and repaired,” he said. The Head of State stressed the importance of ensuring high-quality water supply. “We emphasise that according to the European standards, there should be central water supply in the areas where the population exceeds more than three thousand residents. And this is our duty, this is our standard,” Petro Poroshenko said. According to him, hromadas should also be provided with high-quality electricity, because in some villages, due to low-quality grids, there are still interruptions in electricity supply. “The school should be new both in terms of infrastructure and concept in line with the new standards. And we started to implement this project,” the President noted. “I am glad that we already have more than 500 schools in AHs that meet the standards of the New Ukrainian School. These are not budget expenditures, this is an investment in the future,” Petro Poroshenko said and thanked both the hromadas and teachers involved in this reform. The President also emphasised the importance of providing high-quality medical services. “We launched the rural healthcare reform. For the money that we have confiscated from Yanukovych, we build outpatient clinics with telemedicine. By the way, some people are skeptical about the chances of introducing telemedicine in AHs. Let’s see in a year who was right,” he said. Petro Poroshenko stressed the importance of universal access to the Internet. “The amalgamated hromada, the village cannot work if the leadership of AH, a fire department, a school have no Internet connection. We started a new programme “Where there is light - there is the Internet”. Why? Because every family should have the Internet connection. There should not be a single village with no Internet. It is an opportunity for intellectual development, for gaining new knowledge. This is a qualification of the XXI century,” the President said. According to him, tourism development, especially agritourism in villages and AHs, is also important. “The Odesa Oblast can offer a lot to the tourists. Among the projects for the next three years, I would like to underscore the modernisation of the Odesa airport. This is a really important project for Ukraine and for the Odesa Oblast. We also see that tourism is a resource for a new quality of hromada’s life, as it happens in Vylkove, where the hromada is carrying out modernisation of the city’s sewage system,” the Head of State said. “These are the components that should be present in every AH to my mind,” Petro Poroshenko summed up.